There comes a point in many vehicles’ lives when they become temporarily unneeded, or simply need to be moved out of the way. Some people are lucky enough to have space on their property to store them, but others turn to outside storage facilities for assistance. Whether you personally are providing the storage space, or are looking for a storage facility to do the job for you, below are some tips to help you prep your vehicle for short or long-term storage. When putting a vehicle in storage, whether long or short-term, it is essential that it be put away clean. Leaving dirt and grime inside or outside the vehicle can cause unwanted smells, fabric damage and paint damage, and leave you with a damaged vehicle that you are not going to enjoy driving as much. If you are leaving your vehicle in storage for more than a month, or even longer, or if you are planning on having the car overwinter in self storage, it is vital that you change the oil, filters and coolant before putting it away. By doing so, you can be sure that the vehicle will be drive-ready at the end of the storage period. If you are putting your car into short term storage, you are going to want to put it away with a fresh, full tank of gas. This is because an empty tank can allow moisture to build up and mix with the fuel. Water in the fuel tank is capable of doing a lot of damage to the engine of a car. If the car is going away longer term (for up to a year) you can add fuel stabilizer to the gasoline to maintain its integrity during storage. Tires that sit for too long without enough air pressure can end up developing flat spots which can become huge hazards when you eventually take the car out of storage. You don’t want to find out on your ride home that you are driving on four flat tires. Extra air pressure before storage will ensure that your tires are safe to drive on when it comes time to get your vehicle back on the road. Ideally you should take your battery out of your car before putting it into storage and bring it home to sit on a trickle charger, so that you know it will be fully operational when it is time to drive again. A battery left under the hood during storage can lose its charge permanently. 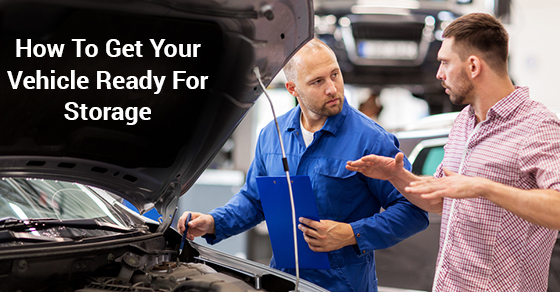 Whether you are putting your vehicle away because of a change of seasons, you are temporarily leaving town, or simply because you have another vehicle that you would like to use, there are some things that you need to do to prep it before it goes away. Proper preparation will make sure that when you take it out, it is fully functional. Keep the above storage advice in mind and protect your vehicle and your investment.